Power washing makes the difference. Restore your sandstone and bring the colour back to your walls & flooring. High pressure water cleaning can be very destructive to sandstone if your not experienced . Power Wash Australia has adopted a unique fingertip controller over the water pressure used when cleaning sensitive substrates like sandstone and its lowering the water pressure that makes the difference. The reality is that porous surfaces like sandstone harbour algae deep down and high pressure water cleaning will only disfigure the stone. Power wash Australia have developed a treatment for sandstone that has a surfactant base that helps deep penetration when applied wet reaching areas plain water can’t reach killing all algae and the spoors giving way to removal with a low pressure clean. Presentation is important, which is why when it comes to sandstone cleaning driveways, walkways, retaining walls or footpaths, you want to be certain the results are positive. When your sandstone surfaces goes black or green due to the infestation of algae, bring it back to life with the Power Wash Australia process – we’ll clean your sandstone surface to make it look brand new again giving you that feeling you had when you had it first built and it looked so… good! Properly equipped with the latest pressure cleaning gear and experienced in handling any driveway, walkway, footpath, walls and fences in Sydney, Power Wash Australia are your sandstone cleaning experts. Servicing all of Sydney, north to Hornsby including St Ives, Turramurra and Wahroonga south to Engadine and west to Katoomba you can be guaranteed a sandstone cleaning job unlike any other. 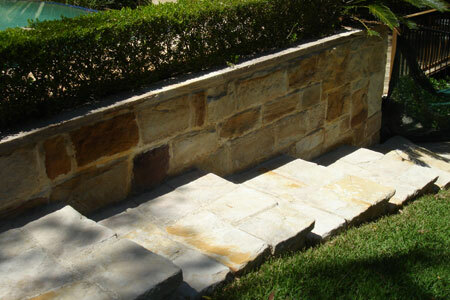 Call us today on 0415 972 645 or get an online quote for quality sandstone cleaning in Sydney. Ask us about our sandstone sealing process.